The Annexe at Southgate Barn is located in the heart of Snettisham, is close to all the village amenities, is accessed by its own gravel driveway and has a private garden with sun patio. It has gas central heating, fully equipped kitchen with dishwasher, lounge area with flat screen TV with Freeview & DVD player and ground floor shower room with Bristan power shower. The ground floor double bedroom and upstairs twin bedroom are finished with blackout blinds and Egyptian cotton bedding to ensure a comfortable night's rest. The shower room is on the ground floor with power shower, hand basin, WC and heated towel rail. The main living space has a settee, leather arm chair, flat screen TV with freeview and DVD player. It also has a small dinning table for 4 people and reading lamp. The settee converts into a sofa bed which linen can be supplied for on request. There is a tennis court in the village that can be hired from the memorial hall at a very reasonable rate. 5 miles from Heacham manor 18 hole course. 6 miles from the King's Lynn parkland course. 8 Miles from the famous Old Hunstanton links course. 12 miles from the Ancient links course at Brancaster. Notes on accommodation: Unfortunately we do not allow dogs or pets in the annexe. Smoking is not permitted in the Annexe Outside: The Annexe has a secure private garden with sun patio. It has an outdoor table and 4 chairs. There is also a secure lockable shed which is suitable for storing bikes or golf clubs. A BBQ and tools are supplied for outdoor entertaining. Cleaning / Towels / Linen / Maid service: Clean towels and linen are supplied on a weekly basis. The annexe was perfect for the four of us to stay for a weekend visit to Sandringham. Andy was the perfect host -letting us know we could get in a bit earlier and leave a bit later if we wanted as there wasn’t another booking on either our arrival or departure day. The cake was delicious and the annexe beautifully clean and very cosy. We would definitely visit again to explore some more of this beautiful area. Thank you for your review, we are pleased you enjoyed your stay and looking forward to seeing you again. We have had a lovely stay in the property, the place was very clean and well presented. Andy was very welcoming and the cake was a lovely touch. Very pieceful and relaxing stay would definatley reccommend and would definatley come back. The property is beautiful and very comfortable. It is extremely clean and welcoming. We arrived to find a home baked cake, milk, tea and coffee as well as other bits in the cupboard. Other things like hand wash, shower gel etc make it feel so much like home from home. Perfect for our short break with the grandkids! Ian S.Where do you live? Andy welcomed us with a chat and some useful info about where to visit. The Annexe was well equipped and spotless. We enjoyed the cake which was waiting for us on our arrival. We only had a couple of nights away but packed a lot in; the local beach at Snettisham, lunch at Hunstanton, fireworks at Kings Lynn and a visit to the deer park farm around the corner. The bedroom upstairs was great for our two grandchildren who are 4 and 2. The blackout blind kept them asleep until we were ready to get up and the bedside lamp could only be switched on from outside which was a nice touch! Our room was very comfortable and the bathroom had a nice power shower. There were even some games in the drawer under the telly to help keep the kids amused. Ali was very helpful when our little granddaughter was sick in the night and replaced the bedding with a nice girly duvet which went down very well. Overall very comfortable. We would definitely recommend a stay! The owner was very helpful from my first enquiry, through booking and during the period leading up to our stay. We were four adults staying for two nights whilst we attended a wedding, we found the annexe very clean and comfortable with some very thoughtful touches to make us feel at home. We would definitely recommend this accommodation particularly for families with young children. A 5 minute drive from Snettisham beach from there you can walk to Heachams sandy beaches. And a short drive away are the colourful cliffs of Hunstanton, the beach huts of Old Hunstanton and endless white sands and dunes of Brancaster and Holkham. 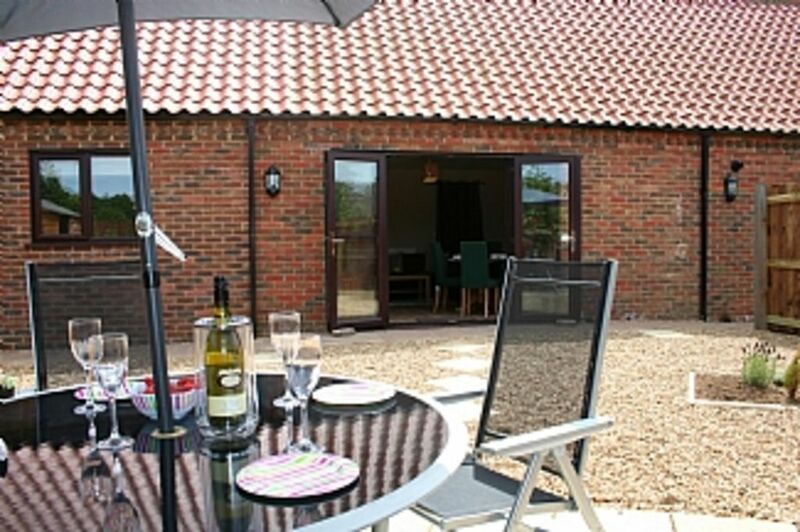 Snettisham is 12 miles from the historical town of King's Lynn and 6 miles from the popular holiday town of Hunstanton. With close links to the villages of Heacham and Dersingham that both offer small supermarkets and a range of restaurants. Booking Notes: Sorry no pets allowed at the Annexe. Booking enquiries can be made by phone or email. A deposit of £100 is required to secure a booking and the balance needs to be paid 28 days before arrival. Changeover Day: Changeover days is usually a Friday though we are happy to be flexible where availability allows. We do offer short mid week breaks and long weekends out of peak season.